Damaris was born in Manhattan, NY, but grew up in a beautiful crafts village called Sugar Loaf, NY, located in the Catskills. She attended the College of St. Rose in Albany, NY, before landing her first full-time job at the University of Rochester Medical Center (URMC) as a Cytotechnologist in September 2003. There, Damaris worked as a Cytotech for nine years, screening for cancer and other infectious diseases. She witnessed a lot of the pain both physically and emotionally associated with the deadly disease. In 2008, Damaris’ cousin was diagnosed with ovarian cancer – and their lives changed forever. Her family embarked on the hardest journey of their lives as caregivers. They did their best to help care, support and love her and her daughter during such a difficult time. By fall of 2009, Damaris knew she was ready to make changes in her life. At that point, she was not only a caregiver, but was in the process of selling her home, purchasing a new one, and completing her Masters in Medical Management at the URMC Simon School of Business (2010). As one can imagine, Damaris’ body was not operating at its optimum capacity, and she knew it was time to make a change. She started doing research and came across the benefits of juicing, fasting and eating a high raw food diet. Damaris was possibly borderline obsessed, especially after she successfully completed her first 10 day juice fast! She felt amazing, clear, and strong! Her GI symptoms started quickly disappearing and she knew she was on to something. In April of 2010, Damaris flew to Maine and attended Alissa Cohen’s Raw Food Instructor training program where she received a certification in teaching and preparing raw vegan food. Since then, Damaris has held workshops and demonstrations on the benefits of incorporating raw food into one’s diet. After returning, she started her first business (DBA) “Foods That Feed”, where she specialized in teaching and preparing raw vegan foods for others. In the same year, Damaris went on to attend the Institute of Integrative Nutrition (IIN) and, in 2011, received her certification as a Holistic Health Coach. IIN is the only nutrition school that integrates all the different dietary theories; combining the knowledge of traditional philosophies with modern concepts like the USDA food pyramid, the glycemic index, and raw foods. Damaris was excited to be part of such an amazing program and movement to spread the love and wealth in health! 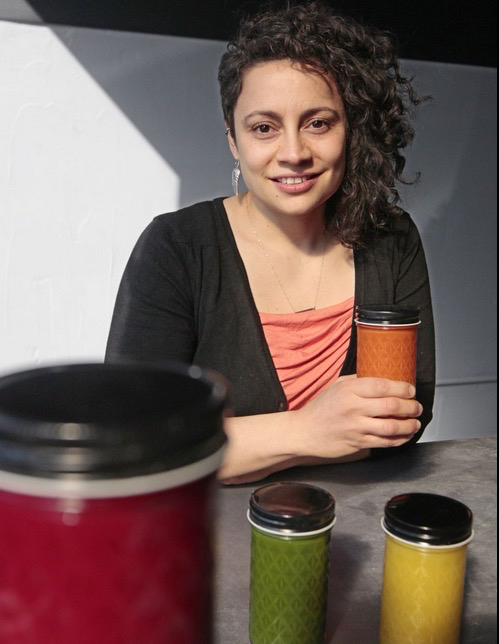 In 2012, Damaris decided she wanted to narrow her niche and focus on just juice. She decided to change her business’s name to “Just Juice 4 Life, LLC”. Juicing was and continues to be the biggest part of her family’s daily ritual, and she knew it was what she needed to focus on. She decided to slowly work her way into Rochester’s local farmer’s market and searched for the perfect juicing trailer. Finally in late March of 2012, she found a 1970 Aristocrat camper and had it renovated to meet the needs of a certified juicing trailer. By late May “Just Juice 4 Life” was actively part of the Brighton Farmer’s Market and started building their customer base. Each week Damaris’ family was inspired by their customers and warmed by their appreciation and love for fresh local juice. On June 14th, 2013, “Just Juice 4 Life” opened their shop space at 713 Park Ave, which was bright and full of amazing energy! They were thrilled and honored to be part of the amazing Park Ave community. On August 15th, 2014, “Just Juice 4 Life” had a huge success in making it into the new local downtown grocery store Hart’s Local Grocers located at 10 Winthrop St. Rochester 14607. Their first delivery of juices SOLD OUT before the night was over! This was a major and exciting milestone for JJ4L. Damaris got a call early the next morning for another order! In 2015, Just Juice 4 Life joined ventures with M/Body Fitness, a new local gym just a few blocks aways from their first location. The union was great but after 2.5 years Just Juice needed additional room to expand. In December of 2017 they found the perfect spot down the road in the heart of the popular and diverse Neighborhood Of The Arts (NOTA) @ 710 University Ave. Just Juice 4 Life continues to see familiar faces and make new friends as they serve the best all-organic juices, smoothies and raw treats in town. They also offer workshops and juice fasting retreats so follow them on social media for updates! As the business grows and thrives, Damaris continues to focus on different projects and workshops to help promote healthy living and eating in a sustainable local way. One of her biggest goals is to support our local farmers, vendors, and small businesses. The more we put in the community the more we will get from it…..so let’s lift each other up! If you have any questions about juicing, raw foods, recipes, or about holistic health coaching don’t hesitate to ask! A huge and heart-warming Thank You to our Rochester community, and everyone who has and continues to support us along our journey to spread the word and healing love we call Juice! Knowledge is power!